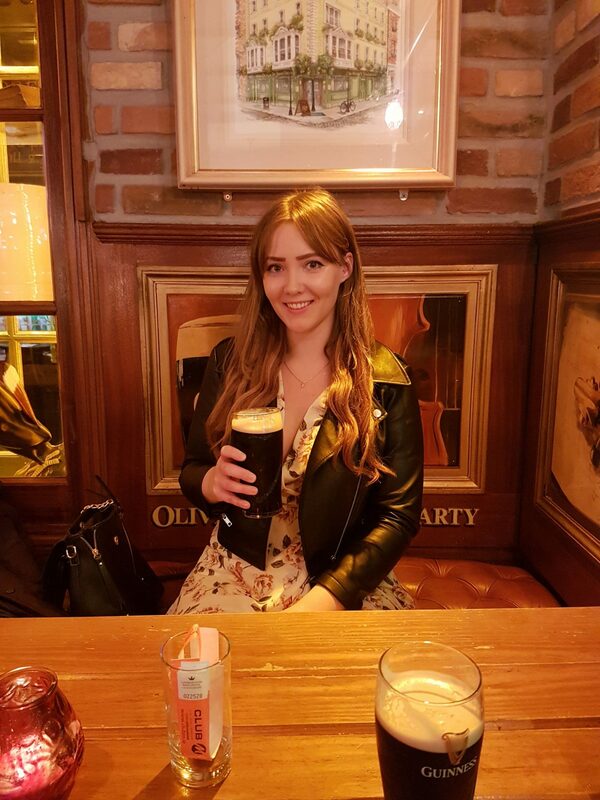 So I have recently returned from my second ever trip to Dublin and I wanted to relay some of my findings in a short city travel guide for you guys AND how you can do Dublin on a budget. I’m really lucky in that one of my best friends calls Dublin his home, so I have experienced the city with someone who lives there. I always think that’s a great way to get to know a city from a locals’ perspective and is one of the reasons why I love chatting to my hosts and getting to know their recommendations when I stay in Air B&Bs. Paul lives in Blackrock, a beautiful suburb of Dublin located south-east of the city centre, right on the coast. The centre is just a 20 minute train away that goes all along the seafront, so close to the tide it’s actually quite miraculous at times that it seems to carry on unaffected (a bit like Paul in putting up with my company)! So, without further ado, here’s my list of things you have to see, do & eat if you’re in Dublin for the weekend AND how to enjoy your visit without breaking the bank. 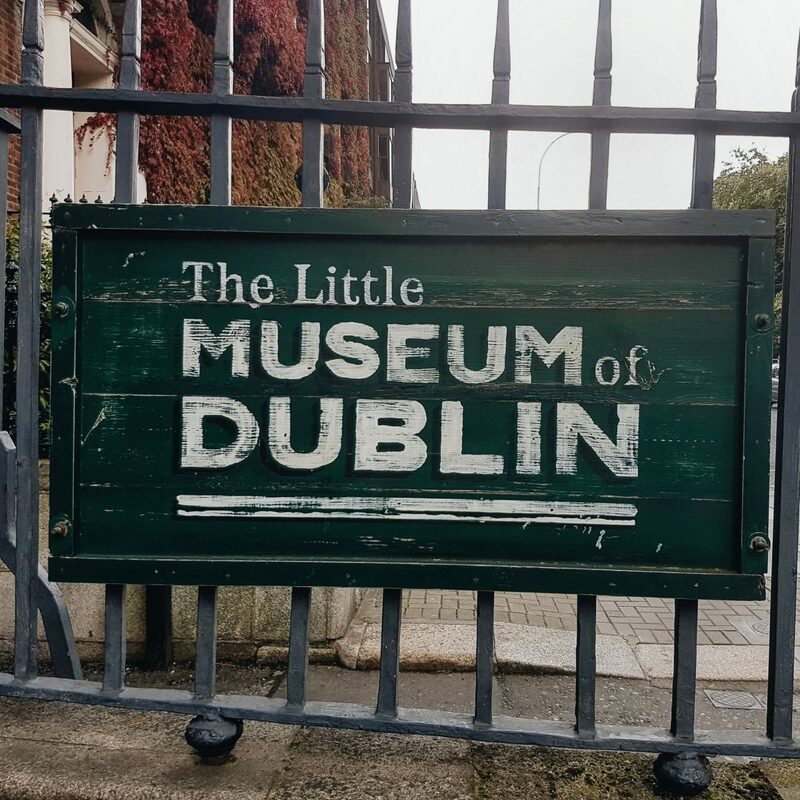 The Little Museum of Dublin is nestled just a two minute walk from the central shopping area of Dublin. It’s rated number 4 on TripAdvisor when it comes to things to do and Number 1 out of all museums in Dublin. Paul had said that he’d heard some really great things about it, so it was first on our agenda for the weekend that I visited. We spent €8 each on student tickets (I thankfully still have my 3 year NUS card that you can buy before you graduate) and that gets you entry to all the floors plus a guided tour of the middle. The bottom floor was fascinating and all about the history of the Irish pub. I found out that the reason people spent so much time in pubs back in the day was because their living conditions were so poor. There was no suitable place in their homes to relax in or socialise. The top floor is home to “The Editor’s Room” all about a history of The Irish Times Robert when it was ran by Robert “Bertie” Smyllie. And in the final room is an exhibition all about rock band U2, aptly named U2: Made in Dublin. The guided tour of the second floor takes just half an hour and takes you through the history of Dublin during the 19th century. Our tour guide June was absolutely lovely and incredibly knowledgeable and, in fact, every member of staff we met there was absolutely delightful to speak to. The best thing about the museum, for me, is that it’s a really manageable size. As much as I love history, I have quite a short-attention span and get bored spending an entire afternoon or day in a museum or historical house (with perhaps the Natural History Museum being an exception!). They have big plans for the little museum and hope, with people’s support, to expand to the house next door in the coming months. It’s definitely somewhere I would reccomend to visit. It’s actually an extremely cute, quirky area of the city centre and one that I would recommend for an afternoons wander. Paul pointed out to me that you know you’re in the Temple Bar by the paving stones on the streets – the area is home to dark cobbles so it’s easy to know whether or not you’re still in that area. There’s tonnes of quirky independent shops, cafes, and restaurants as well as artistic graffiti and buildings. If you’re a vintage fan, I would recommend a visit to Lucy’s Lounge on 11 Fownes Street. Though the boutique is in the basement you can’t miss the building, as it’s a beautiful candy pink! 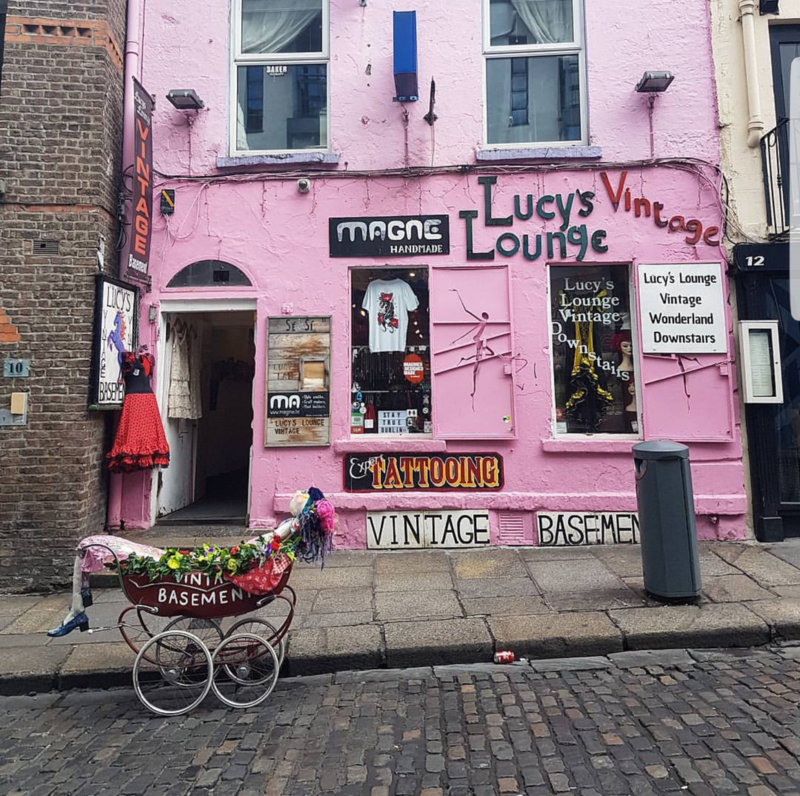 Though I was told Temple Bar can be expensive, last time I went to Lucy’s Lounge I picked up the most adorable 50s culotte playsuit that’s red with little white hearts all over it for €25, so there it isn’t the kind of place where you walk in and (depressingly) can’t afford anything. As the lovely sales assistant I met said “The most people will happily spend without thinking about it too much is about 30 euros. We like to sell cheap and sell lots so we can keep a constant flow of new stock”. Amen to that! 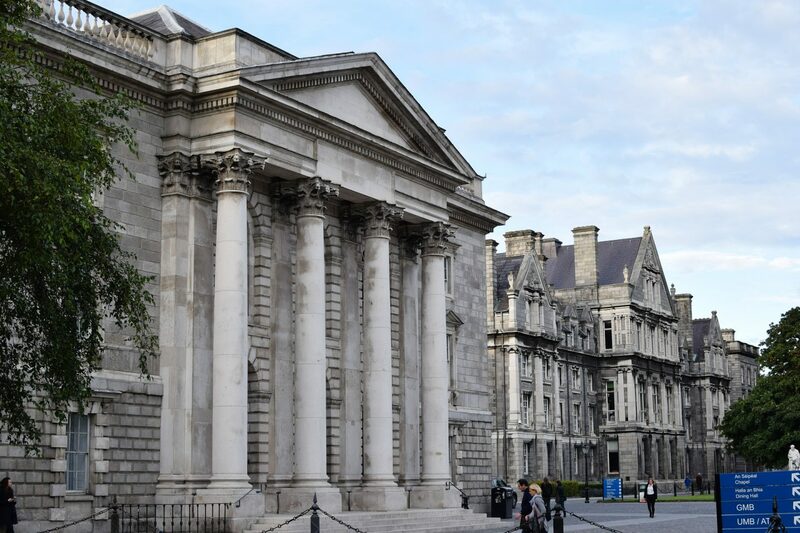 Trinity College Dublin, otherwise known as the University of Dublin, is nestled right in the middle of the city and it’s worth taking some time out to wander around the grounds as it is an absolutely beautiful campus. You can pay to go inside the libraries, which I have on good authority are an absolute spectacle in themselves and could be reasonably likened to the ones out of Harry Potter! 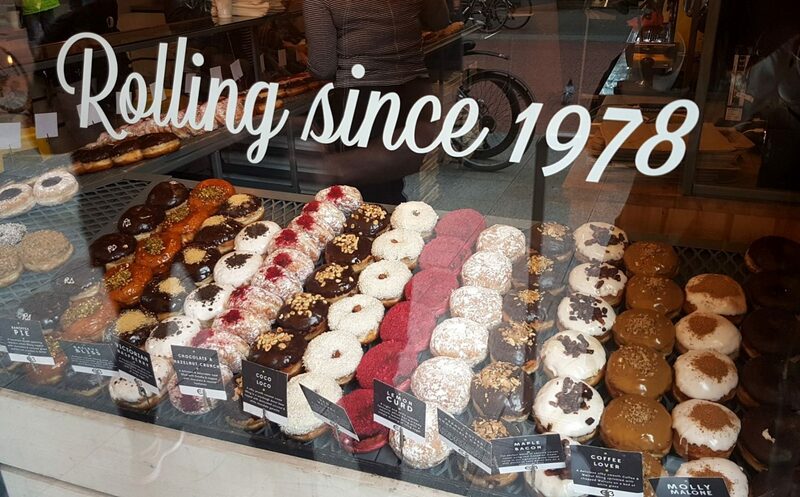 One of the first things I noticed about Dublin is their love of donuts! Not perhaps the most obvious association, but there are numerous chains selling the delicious treats almost everywhere you go around the city centre. The small chain store that I would recommend above all others would be The Rolling Donut Co. The best way I can describe these guys is the quality of your best hipster coffee shop donuts, in a chain store. They’re made every morning using sourdough and come in a vast variety of flavours including options for vegetarians and vegans. My favorite has to be the chocolate one with peanut butter in the centre. At €3 I think they’d great value for money as they are HUGE and so filling! 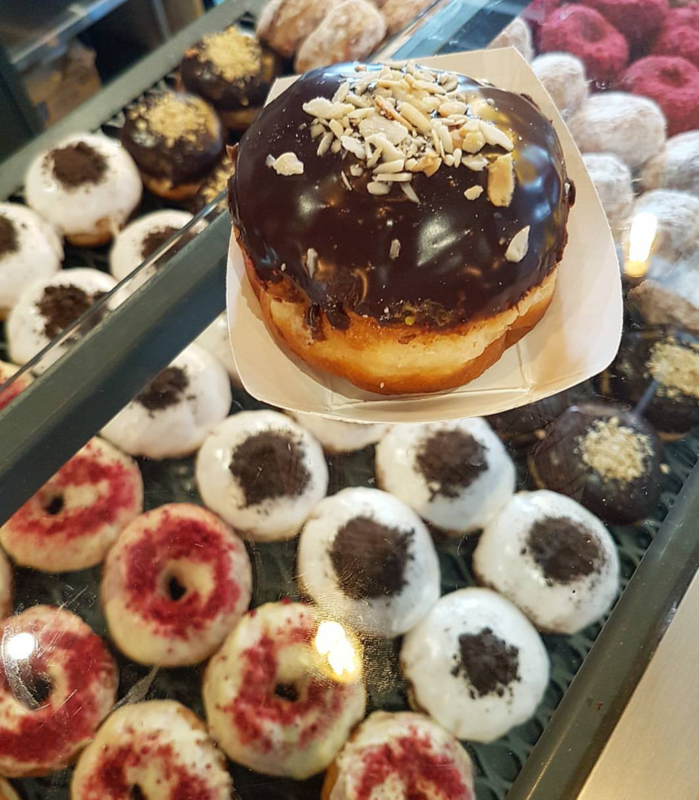 The Rolling Donut Co also do a fab coffee deal where you can get a coffee and donut for €5. My second favorite place would be Off Beat Donuts Co – they give more of a Krispy Kreme than hipster coffee shop vibe, but the donuts are good… however they’re not quite to the same standard as The Rolling Donut Co in my humble opinion. For the Guinness drinkers amongst you, Dublin is basically heaven on earth. In fact, for fans of drinking in general, Dublin is still heaven on earth. Ha! Irish bars have a rowdy, fun reputation for a reason and you won’t be short of finding any in Dublin. If you want to do something very “typically touristy”, though I haven’t yet been, I’ve been told to recommend the Guinness store house. It is, of course, like the number 1 touristy thing to do in Dublin but apparently it’s pretty good, though a little pricey at around €20 per adult ticket during peak times (after 9.30am). 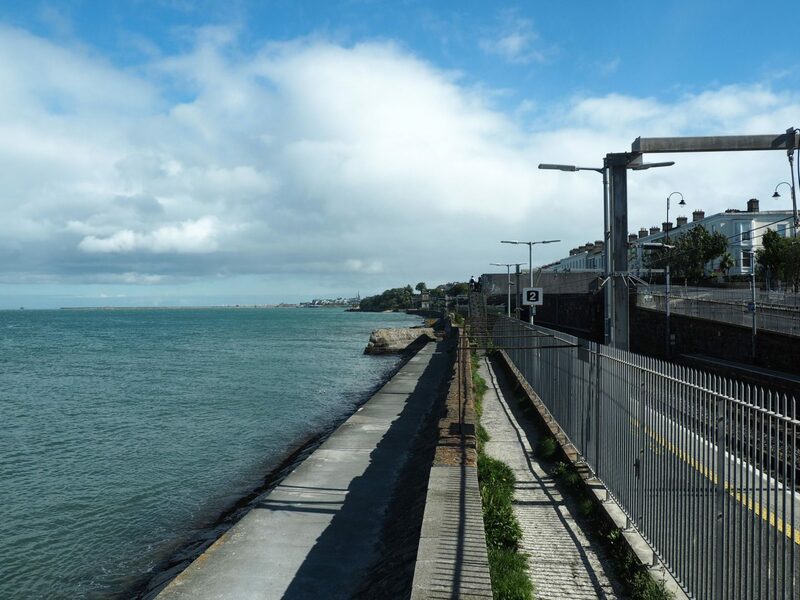 Dun Laoghaire (pronounced Dun-Leery) is a small coastal town just under an hour away on the train from central Dublin. 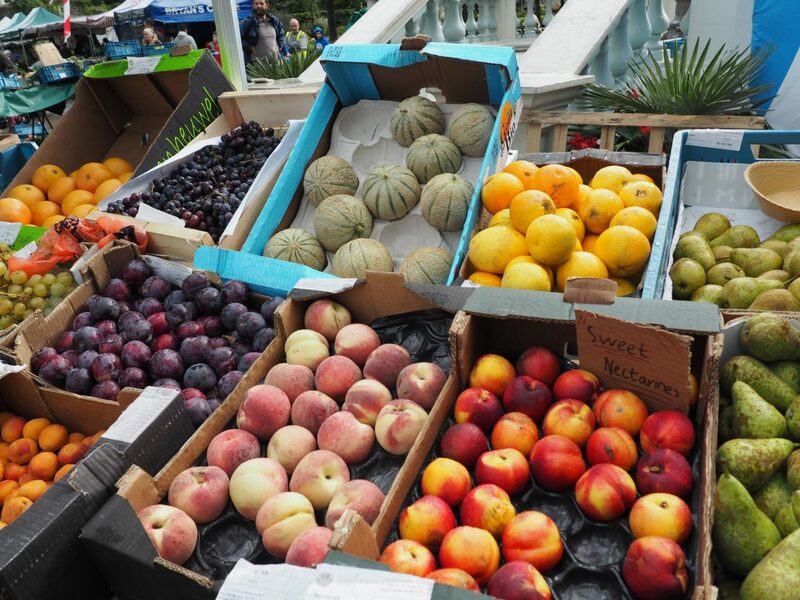 Every Sunday they do a farmer’s market in People’s Park that attracts visitors from all over the area but even on other days, it is a beautiful place to visit. 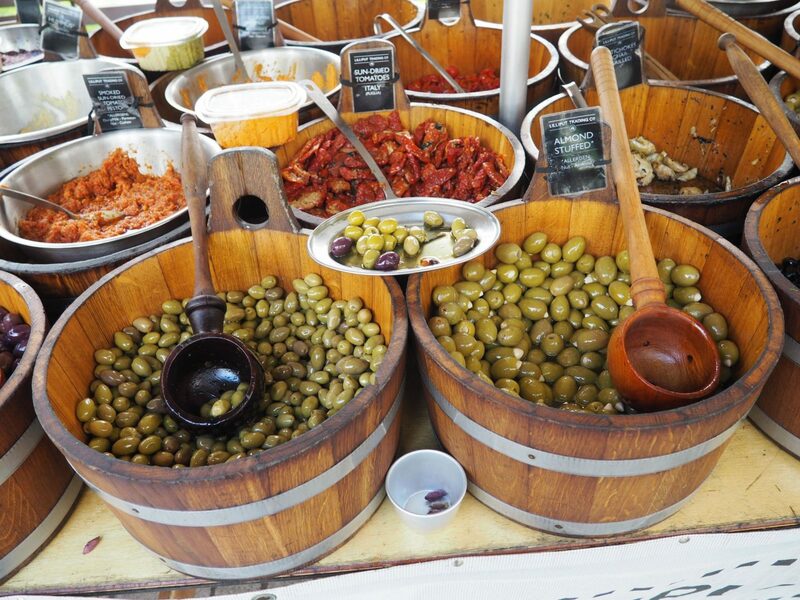 The Farmer’s Market is small but brings people from all over Dublin for a day out. 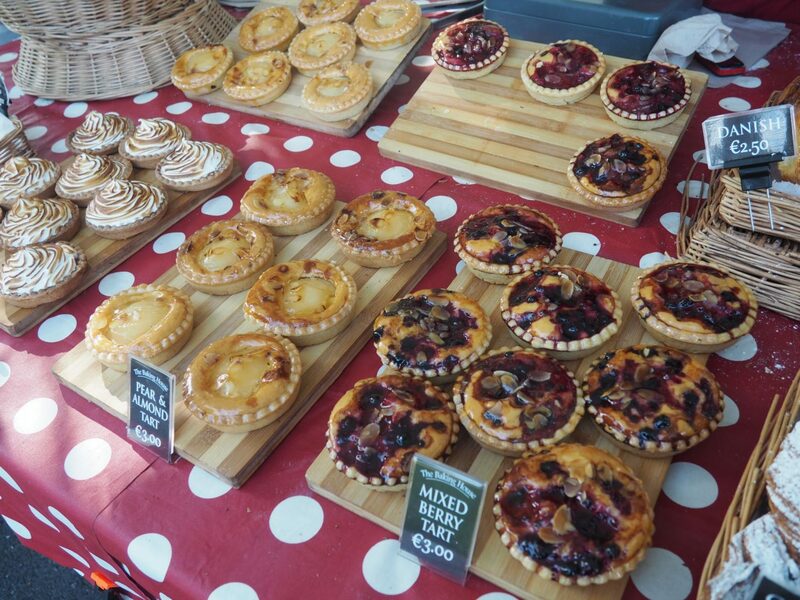 There’s delicious, reasonably priced food of every description – I can vouch for the Irish BBQ beef burgers and the man who does desserts in the centre of the market – I had the most INCREDIBLE salted caramel brownie from him. Dun Laoghaire also has a beautiful pier which is worth a visit if the weather is nice. Freshly Chopped (or just Chopped to locals) is possibly the best salad bar EVER and I do not say that lightly. If you’re anything like me, you’ll see the words “salad bar” and recoil in terror but these ones are actually amazing and above all else… FILLING. The reason? 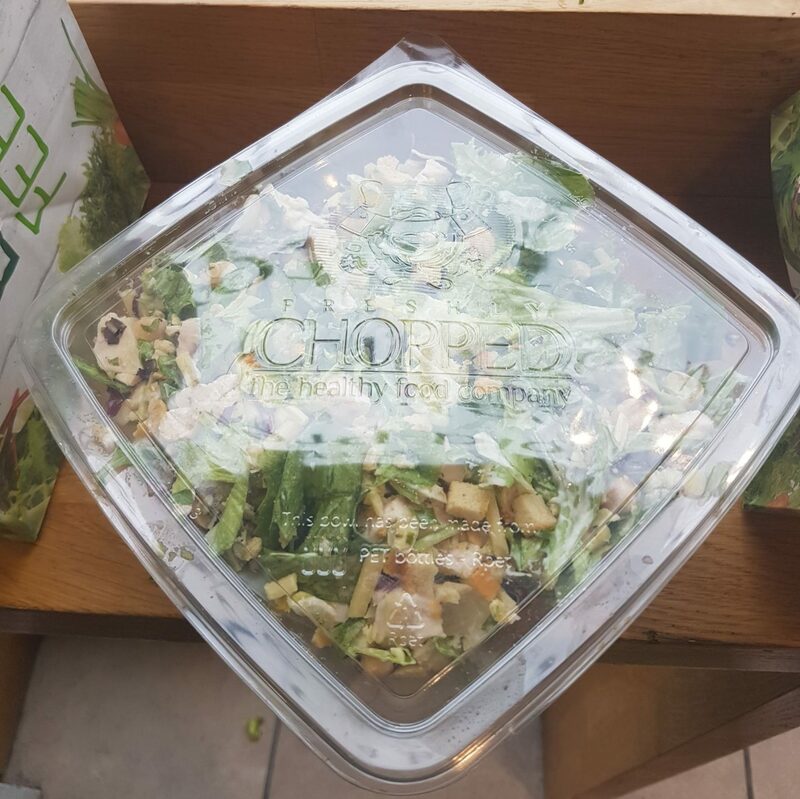 They custom make them from a source of protein, salad, extras and dressing and then chop them (the clue’s in the name, eh) all up into a biiiiig salad bowl that’s incredibly easy to eat. My favorite (though definitely not the healthiest option) is the Dubliner Caesar which has lemon and herb chicken, croutons, red onion, salad, and cheese. I usually add in extra chickpeas and avocado and it’s all chopped up into a delicious bowl of salad-y goodness. They usually cost around €5-6 (a little pricey but no worse than a London Pret) and you won’t believe how great (and filling) they are until you try one – trust me. Dublin is a little different than my other weekend adventures as I get to stay with Paul for free, but you may remember that back when I decided to launch the feature I wanted to be able to do my trips for £150 or under all inclusive for the weekend, and £200 for a long weekend. I found a basic but central Air B&B for £110 for a Friday and Saturday night (so £55 each for 2 nights). I also found this Air B&B home that’s a lot nicer for £153 for 2 people for 2 nights so if you fancied breaking the £150 rule and spending a bit more it’d be ideal. 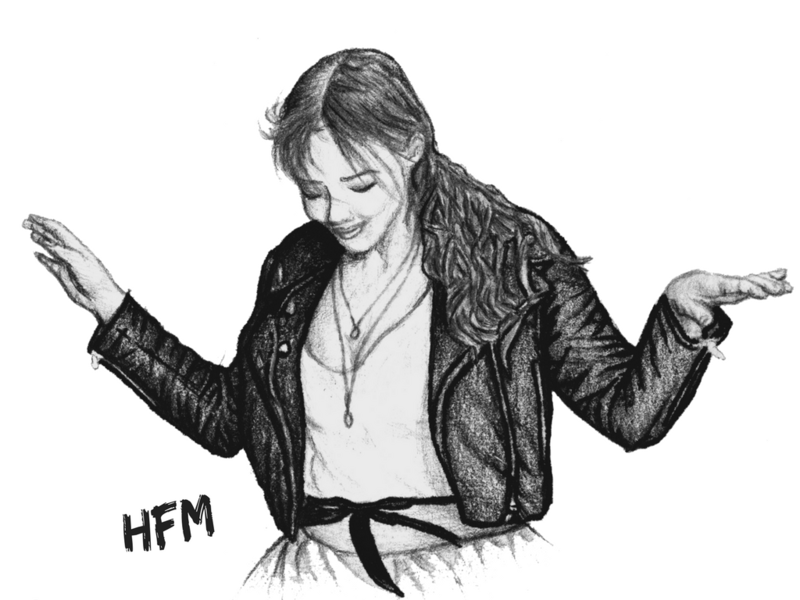 If you’re not signed up to Air B&B, firstly, why the hell not?! Secondly, you can get £15 off your first stay that’s over £55 with my sign up link. This left me with £131 remaining for food/spending money or £76 if I had had to pay for accommodation. So, even if I’d had to pay for accommodation it would still have been very much achievable to do the whole trip for under £200 all in, or £150 if I’d gone for just the weekend. Dublin is quite an expensive city, so I’m not surprised it came to the latter end but I’ve still proved that you could the vast majority all the activities above on a weekend and still have £26 for food left over (bear in mind also that I stayed for 3 days and did a long weekend, not 2). You’d probably have to get a takeaway and some meal deals food-wise but the important thing is, it can be done! Of course there are even cheaper Air B&Bs but they are, understandably, less nice than the ones I found or further out of the city centre. The £110 one was basic but good for the price and the £153 one undeniably nice and a good alternate to an expensive hotel. To put it in context, a quick search of central hotels in Dublin on a Friday & Saturday night came back with anything from £100 to over £200 PER NIGHT. That’s more than I spent on my entire trip!!! Air B&Bs are amazing and I honestly can’t sing their praises enough. They’re an absolute no brainer for me when you’re looking at that kind of cost. Bear in mind too that I stayed in Dublin for three days, not two. If you wanted to keep costs down you could fly early on Saturday morning and return late on the Sunday – though Saturday and Sunday flights do tend to be more expensive, you’d have to weigh up whether it’d be cheaper to pay more for flights and save by not paying for accommodation on the Friday night, or the other way around. TOP TIP: When you go to book flights, do so on incognito browsing. If you’ve visited a site more than once, the cookies the site collects will know you’re interested and then raise the flight prices. Even better, if you could book two days off work mid-week everything, flights, hotels, even some Air B&Bs etc will be much cheaper. As I was staying with a friend I actually had quite a lot of money spare and came back with about £50 at the end of my trip which was great but hopefully I have proven that you can do Dublin on a budget and not be sitting in a hostel crying into your shop-bought can of Guinness! Any questions, please fire them my way in the comments or on social media.